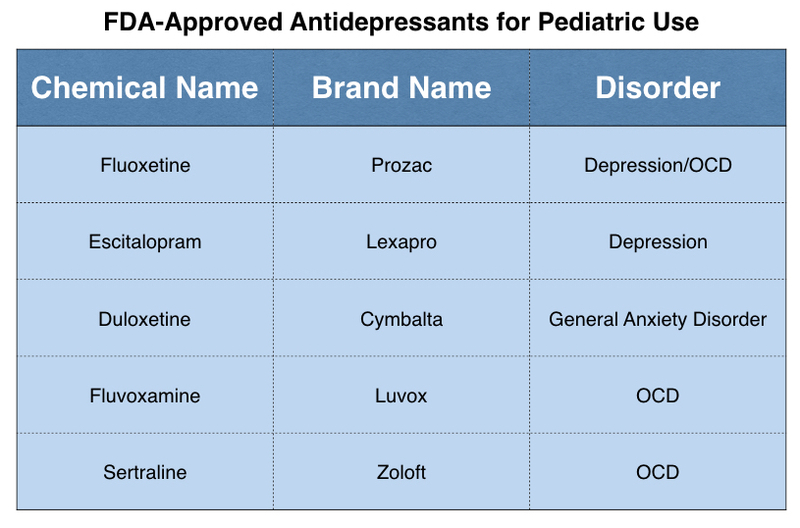 In general, clinical studies have not shown that antidepressants are more effective than placebo as a treatment for pediatric depression (although the FDA has approved five antidepressants for treating various pediatric disorders.) These medications may cause a broad range of physical, emotional, and psychiatric adverse effects. 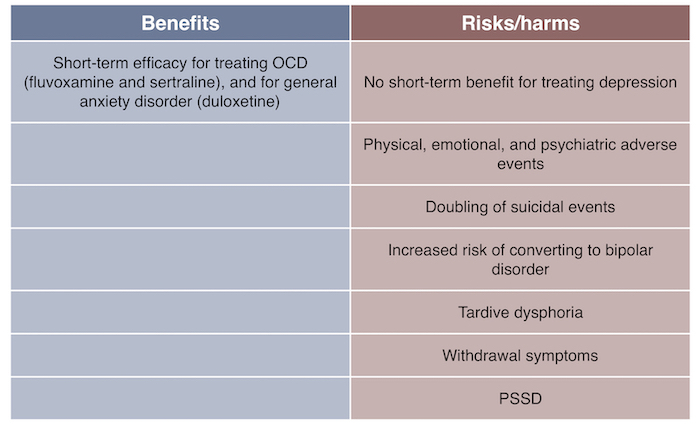 They increase the risk of suicidal events and conversion to bipolar disorder. They may induce a chronic dysphoria over the long-term, and children and adolescents may suffer “mild to moderate to severe” withdrawal symptoms when quitting the medication. Teenagers who are prescribed SSRIs for longer periods of time may suffer from “persistent sexual dysfunction” even after withdrawing from the medication. However, once Prozac and other SSRIs came to market, academic psychiatrists rethought this belief. They began arguing that adolescent depression had long gone “underrecognized” and “undertreated,” and then, with funding from pharmaceutical companies, they reported that clinical trials had shown that SSRIs were an effective treatment in this age group. By the late 1990s, the reconceptualization of moodiness in children and adolescents as an illness, as opposed to a normative part of childhood, was complete. Based on these diagnostic criteria, one in nine adolescents is now said to suffer a major depressive episode each year. The annual prevalence rate is three times higher for adolescent girls (17.3%), than it is for adolescent boys (5.7%). The DSM also lists depressive disorders of a milder sort, and if a moody child doesn’t “meet the criteria for any of the other depressive disorder categories,” a diagnosis of “unspecified depressive disorder” can be made. Antidepressants may be prescribed for these milder conditions, and are also prescribed for pediatric anxiety disorders. 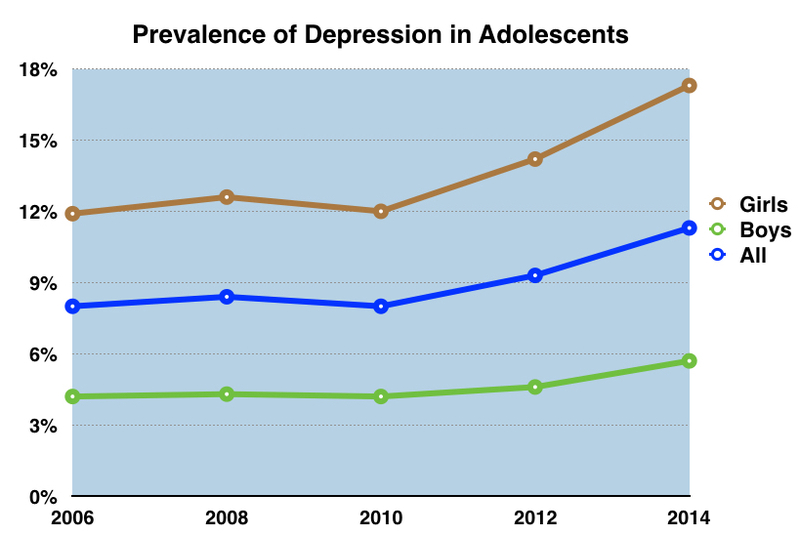 The prescribing of antidepressants to children and adolescents steadily climbs as they age, and by age 17, about one in every 15 youth is prescribed an antidepressant. That was the data in 2014, and that rate is thought to have increased since then. This binding action either causes the second neuron to fire or inhibits its firing. An excitatory response passes the message along the neuronal pathway; an inhibitory response dampens this neuronal activity. 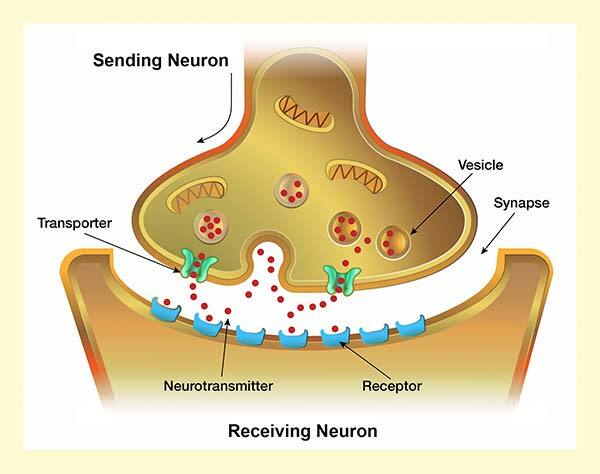 To end the message, the chemical messenger is then “transported” back into the first neuron and stored for later re-use. In a 1996 paper, then National Institute of Mental Health (NIMH) director Stephen Hyman provided a good description of how psychiatric medications actually “work.” The drugs are better understood as agents that create abnormalities in brain function. 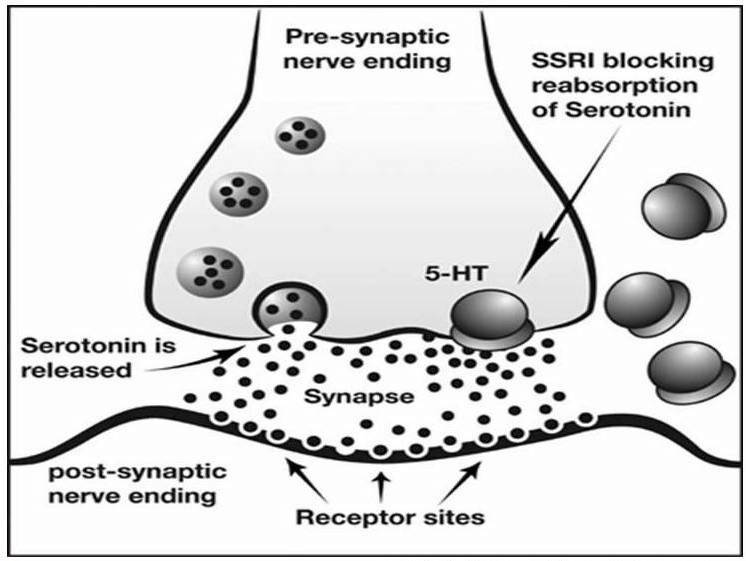 Selective serotonin reuptake inhibitors (SSRIs) work by blocking the normal reuptake of serotonin from the synaptic cleft, and thus this neurotransmitter stays longer in that gap than normal. As such, it is thought to increase serotonergic activity. Serotonin is a very common neurotransmitter. In response to this “perturbation,” the brain decreases its own serotonergic activity. Brain neurons begin to release less serotonin and, within a short period of time, the “entire pool of serotonin in the forebrain declines. In addition, neurons decrease the density of their brain receptors for serotonin. Chronic treatment with an SSRI may lead to a 50% reduction in serotonin receptors in the brain. At that point, the brain has become “densensitized” to serotonin. SNRI antidepressants block the normal reuptake of both serotonin and norephinephrine, and as such, the expectation would be that the brain, because of its compensatory mechanisms, would become desensitized to both of these neurotransmitters. Unfortunately, the published results of industry-funded trials of antidepressants for pediatric use are known to be unreliable. Negative findings were spun into positive results; suicidal events in the treated group were hidden; adverse effects were downplayed or went unreported. This type of corruption was also present in a large study of pediatric depression by the NIMH. “The story of research into selective inhibitor use in childhood depression is one of confusion, manipulation, and institutional failure,” the Lancet wrote in a 2004 editorial. Even so, a 2016 meta-analysis of the published literature, which assesses the outcomes from 34 trials involving 5260 patients and 14 antidepressants, found little evidence that these drugs provide any benefit over placebo in children and adolescents. The “quality of the evidence was very low,” the investigators wrote, with 88% of the studies rated at high or moderate risk of bias. In this review of low-quality, biased trials, the only antidepressant that was found to provide a “statistically significant benefit” in depressed youth was fluoxetine (Prozac). In 2018, investigators who relied on FDA reviews of such trials, or found some other method for accessing trial data (and thus did not rely on reports published in the medical journal), found that all 20 pediatric studies of antidepressants conducted from 1990 to 2005 were negative on primary outcome measures (such as reduction of depressive symptoms). The drugs provided no benefit over placebo. This was true of the two trials of fluoxetine that, in the published reports, told of a drug that provided a “statistically significant benefit” in children and adolescents. Most of the 15 studies conducted since 2005 were also negative on their primary outcome measures. In their 2018 review, the investigators did find some evidence that SSRIs might provide a benefit for treating pediatric OCD and anxiety disorders. The emotional numbing that is often a side effect of such drug treatment may provide a benefit in these conditions. In spite of the negative findings from these two meta-analyses, the FDA has approved fluoxetine and escitalopram for pediatric depression. It also has approved duloxetine for generalized anxiety disorder in pediatric patients; and fluoxetine, fluvoxamine, and sertraline for pediatric OCD. The FDA has also approved one older antidepressant, the tricyclic clomipramine (Afranil), to treat depression in youth 10 to 18 years old. However, the efficacy data for this older class of drugs is even more suspect than it is for the SSRIs and SNRIs. As a 1992 editorial in the Journal of Child and Adolescent Psychopharmacology acknowledged, “research studies certainly have not supported the efficacy of tricyclic antidepressants in treated depressed adolescents.” The prescribing of antidepressants to children and adolescents, on any sort of frequent basis, began with the arrival of the SSRIs and SNRIs in the 1990s, and thus this MIA review is focused on those two classes of drugs. In addition to being a very common neurotransmitter, serotonin plays a vital role in gut function and is found in the blood plasma too. As a result, SSRIs and SNRIs can cause a wide range of physical, emotional, and psychiatric adverse effects in both adults and children. SSRIs and SNRIs may cause nausea, vomiting, insomnia, sedation, constipation, fainting, sweating, headaches, palpitations, rashes, weight gain, blurred vision, tremors, shivering, high fever and seizures. Emotional and psychiatric side effects include depersonalization, derealization, confusion, mania and psychosis. In teenagers and adults, sexual dysfunction is common, and a significant percentage of youth may experience a severe inner agitation called akathisia, which is associated with an increased risk of violence and suicide. In the short-term clinical trials of SSRIs, 4% of the medicated youth became “suicidal,” which was double the rate for those on placebo. This led the FDA to put a black box warning on antidepressants that they increased the risk of a suicidal event. 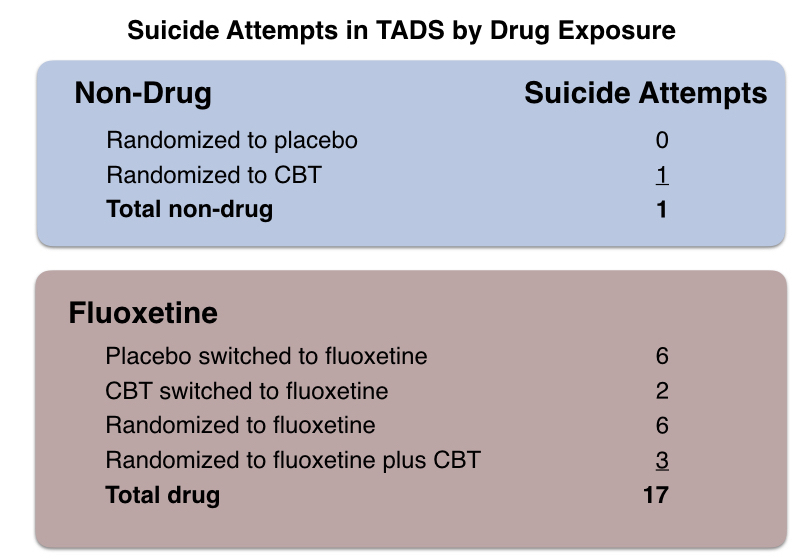 In a large NIMH study, known as the TADs study, 22% of adolescents treated with an SSRI had a suicide event, compared with 6.7% of those not taking the drug. Seventeen of the 18 youth who attempted suicide during the study were taking an antidepressant. Source: B. Vitiello.”Suicidal events in the treatment for adolescents with depression.” J. Clin Psychiatry 70 (2009):741-7. Meanwhile, a 2006 study of two cohorts of youth 6 to 18 years old, with matched severity of depression, found that the group treated with an antidepressant were significantly more likely to attempt and complete suicide. It has long been known that antidepressants increase the risk that a person diagnosed with unipolar depression will suffer a manic episode and be newly diagnosed with bipolar disorder. In 2004, Yale University investigators determined that risk was particularly pronounced for children and adolescents. The use of an antidepressant increased the conversion risk seven-fold for children 5 to 9 years old, four-fold for those 10 to 14 years old, and slightly more than two-fold for those 15 to 19 years old. Source: A. Martin. “Age effects on antidepressant-induced manic conversion,” Arch of Pediatrics & Adolescent Medicine(2002) 158: 773-80. Those increased risks occurred during the first ten months of treatment. At the end of four years, researchers reported that 25% of depressed children treated with an antidepressant have converted to a bipolar diagnosis. At the end of 10 years, 50% of youth diagnosed with depression before they hit puberty had converted to bipolar disorder, researchers at Washington University found. With the prescribing of SSRIs to children and adolescents taking off in the 1990s, so too did the number of youth diagnosed with bipolar disorder. The percentage of children 0 to 19 years old so diagnosed rose forty-fold from 1994 to 2003. This dysphoria may be different in kind from depression: Those suffering from it complain of feeling numb, or simply not caring about others. It appears that it not be so much a depressive state, but rather “I just don’t care about anything” state. While this long-term worsening hasn’t been studied in youth, it is thought to be due to the desensitization of the serotonergic system, which is a regular occurrence with exposure to an SSRI or SNRI. In an international survey of nearly 1,500 adult users of antidepressants from 38 countries, roughly two-thirds complained of dysphoric effects. In surveys of adult users of antidepressants, more than half of the respondents have told of experiencing withdrawal symptoms when coming off the drugs, which they often rated as “severe.” Clinical studies assessing this risk have reported that a lower percentage of patients experience such withdrawal difficulties, and that the risk varies greatly depending on which antidepressant the person had been taking. Source: S. Hosenbocus. “SSRIs and SNRIs: A review of the discontinuation syndrome in children and adolescents. J Can Acad Child Adolesc Psychiatry 20 (2011):60-67. For children and adolescents, the SNRI venlafaxine (Effexor) and paroxetine (Paxil) appear to be the most problematic antidepressants to withdraw from. Neither of those drugs is licensed for pediatric use in the United States but may be prescribed off-label. There are wildly disparate reports on how long such withdrawal symptoms typically last. Four studies that researched this question reported a “mean duration” of symptoms that ranged from a low of five days to a high of 79 weeks. 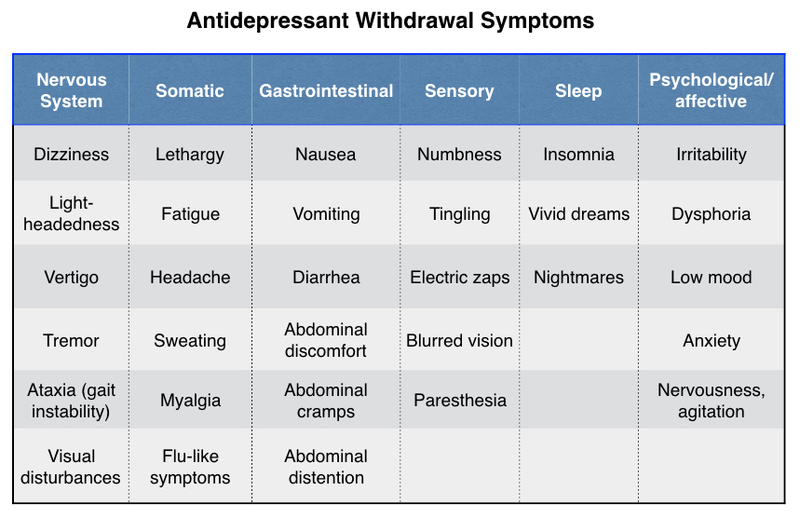 There are also many personal anecdotes of withdrawal syndromes that have continued indefinitely, which has raised concerns that these symptoms are evidence of permanent damage to their nervous systems. Antidepressants are known to cause sexual difficulties, or dysfunction, in a significant percentage of adult patients. Such sexual difficulty may persist after drug withdrawal, which is a condition that has been labeled PSSD: post-SSRI sexual dysfunction. Those suffering from PSSD complain of genital numbing, loss of libido, difficulties getting aroused, pleasureless orgasms, and other oddities. They also regularly tell of being emotionally muted in other areas of their lives, a symptom that is a hallmark of drug-induced tardive dysphoria. The incidence of PSSD is unknown, although there is anecdotal evidence—and evidence from rat studies—that suggest it may pose a particularly high risk to those exposed to antidepressants as teenagers, with the thought that the drug exposure interferes with normal sexual development during a “hormonally transformative” time. Rats reach puberty 45 days after birth, and when male rats are exposed to an SSRI during adolescence (days 25 to 60), they end up with “impaired sexual copulatory behaviors in adulthood.” They mount females less frequently, they are anxious in their behaviors, and when they do mount females, they take a longer time to ejaculate. 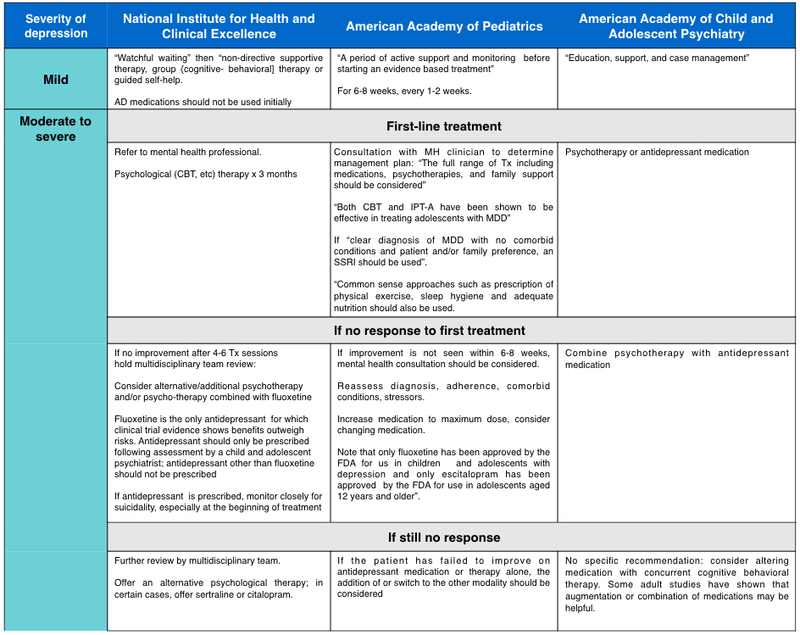 There are notable differences in the clinical practice guidelines for adolescent depression issued by the National Institute of Clinical Excellence in the UK, the American Academy of Pediatrics, and the American Academy of Child and Adolescent Psychiatry. None of the three recommends antidepressant medication as a first-line treatment for adolescent depression. However, regarding treatments for moderate to severe depression, the NICE guidelines still warn about the use of antidepressants, stating that only fluoxetine has been shown to provide a favorable risk-benefit ratio in clinical trials. In contrast, the American Academy of Child and Adolescent Psychiatry recommends antidepressant medication as a first-line treatment for moderate to severe depression, and doesn’t identify any antidepressant as preferable to another. The guidelines from the American Academy of Pediatrics fall somewhere in the middle of the other two regarding the use of antidepressants; less restrictive than the NICE guidelines, but more cautious than the ones issued by the American Academy of Chile and Adolescent Psychiatry. As can be seen in a table of clinical practice guidelines for adolescent depression (click link or see below), the first step in the decision-making process requires making a distinction between mild depression, and moderate/severe depression. Parents seeking help for a depressed should be aware of this distinction as they evaluate what might be the best treatment. For a summary of scientific research on non-drug therapies for depression, visit this page. Book: Robert Whitaker, Anatomy of an Epidemic, pages 229-246.